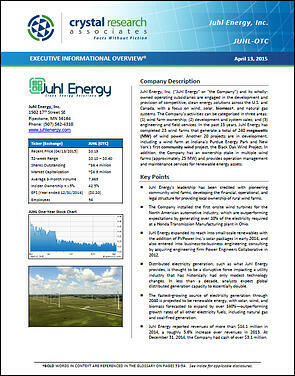 Juhl Energy, Inc. (“Juhl Energy” or “the Company”) and its wholly-owned operating subsidiaries are engaged in the development and provision of competitive, clean energy solutions across the U.S. and Canada, with a focus on wind, solar, biomass, and natural gas systems. The Company’s activities can be categorized in three areas: (1) wind farm ownership; (2) development and system sales; and (3) engineering and field services. In the past 15 years, Juhl Energy has completed 23 wind farms that generate a total of 240 megawatts (MW) of wind power. Another 20 projects are in development, including a wind farm at Indiana’s Purdue Energy Park and New York’s first community wind project, the Black Oak Wind Project. In addition, the Company has an ownership stake in multiple wind farms (approximately 25 MW) and provides operation management and maintenance services for renewable energy assets. * The Corporate Snapshot was last updated on April 13, 2015.